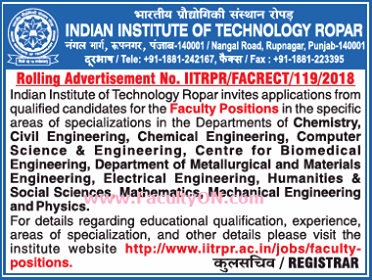 Indian Institute of Technology, Ropar has advertised in Times of India Newspaper for the recruitment of Professor job vacancies. Interested and eligible job aspirants are requested to apply by earliest. Check out further more details below. About College: Indian Institute of Technology, Ropar is one of the eight new IITs set up by the Ministry of Human Resource Development (MHRD), Government of India, to expand the reach and enhance the quality of technical education in the country. This institute is committed to providing state-of-the-art technical education in a variety of fields and also for facilitating transmission of knowledge in keeping with latest developments in pedagogy. These two areas of focus will enable students to gain exposure to recent trends in their chosen domains of study and gain practical experience through a wide variety of activities the institute facilitates in its own campus and arranges for in collaboration with industry and other institutes.